Jack Black, living legend, has just joined the meme canon, cementing his place in history forever. Even better, it was a total accident – as memes often are – when he and two perfect strangers crossed paths like ships in the night to perfectly replicate the biggest meme of 2017. 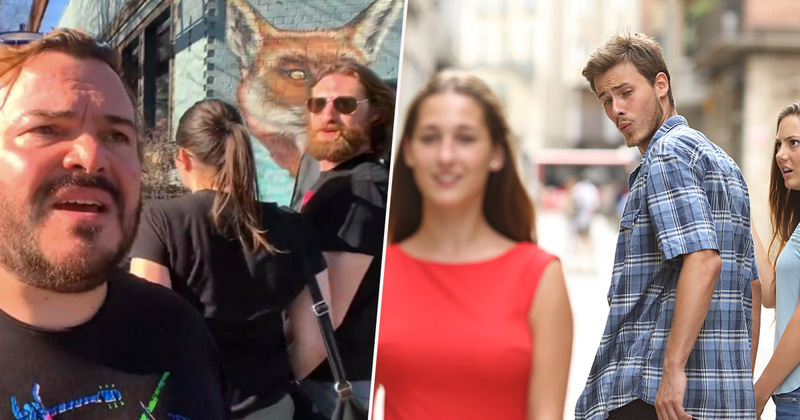 You know the one: Distracted Boyfriend and Jealous Girlfriend. 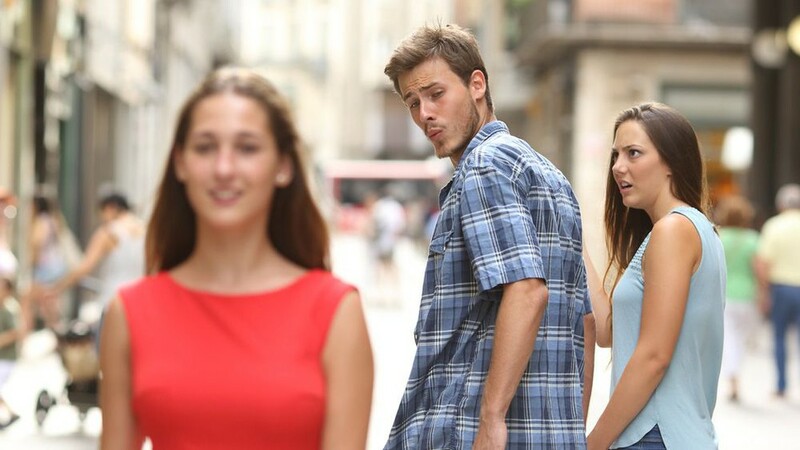 The original Distracted Boyfriend meme, a stock photo shot by Italian photographer Antonio Guillem, featuring three of his regular models, depicts a man checking out another woman while holding his girlfriend’s hand. It’s been shared in many different conceptions; with the youth being attracted by communism and turning away from socialism; Star Wars fans getting distracted by Porgs and abandoning Jar Jar Binks; President Donald Trump staring straight into the solar eclipse; you name anything relevant to the zeitgeist of the past few years and the meme has covered it. 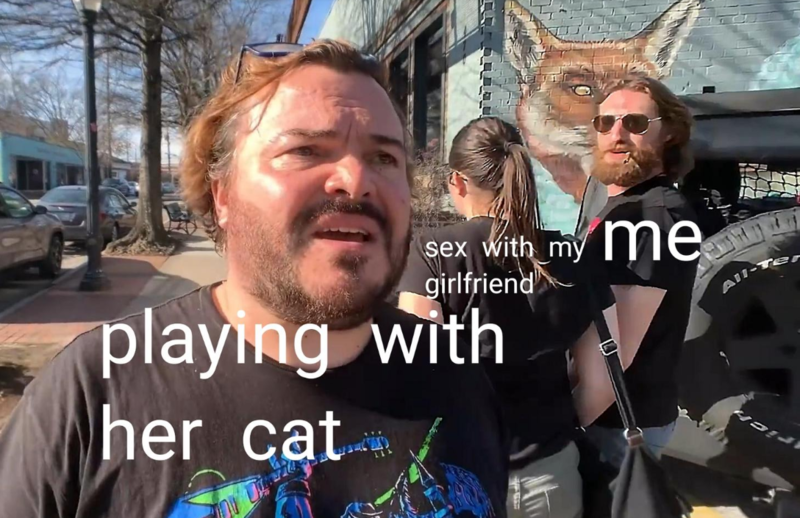 But, as it looks more and more likely the Distracted Boyfriend meme-makers have exhausted all interpretations, Jack Black – the Tenacious D songwriter and School of Rock actor – swoops in and saves the day. The 49-year-old was filming around Atlanta for his YouTube channel Jablinski Games, sampling local restaurants and singing with a street performer. It’s awesome. What’re the chances you got distracted from the task at hand by Black’s awesomeness? High, I bet. You wouldn’t be alone, after all, just like the guy who appears about eight minutes into the video hand-in-hand with his girlfriend. In case you couldn’t spot the moment he turns and stops in his tracks, someone on Twitter going by the handle @StoicIDir has snipped the moment into a glorious little clip for you to replay over and over again. Particularly enjoy the second-long aftermath when the couple have stopped dead in their tracks and the boyfriend proceeds to look over his shoulder. You can almost hear him telling his girlfriend he thinks that was Jack Black who just walked past with a camera crew. Now, people in the video comments section are calling for Black to host Meme Review next, in between his busy schedule of breaking through box walls, eating burgers, pumping iron, and doing Cribs-style reviews of his trailers. It’s great when life reflects art, isn’t it? And if memes aren’t the modern masterpieces, then I don’t know what is cool anymore.